Three times Reserve High in Trial! Plus a High on Ducks, that was not HIT because combined with sheep. Male Bi-black (bi-color carrying black), at 17 months 25 ½ inches and a very lean 72 pounds. 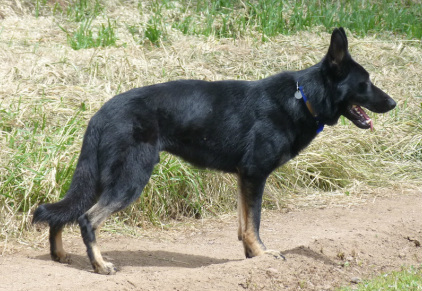 Karu is German SV A-stamped (both hips and elbows rated “Normal”), results on file with GSDCA-WDA & SV. And is DNA'd as DM Clear. Etiology (or What’s in a name): after Hikaru Sulu, main character in the original Star Trek series, call name Karu. BTW: Hikaru’s paternal grandfather is a Japanese import. 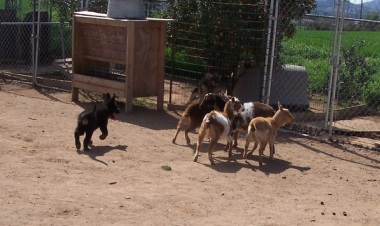 Above: Karu working adult Nigerian Dwarf Goats at 11-weeks-old. Karu tending graze with goats eating right up to the edge of the graze. Note lush, yummy oat crop behind Karu. 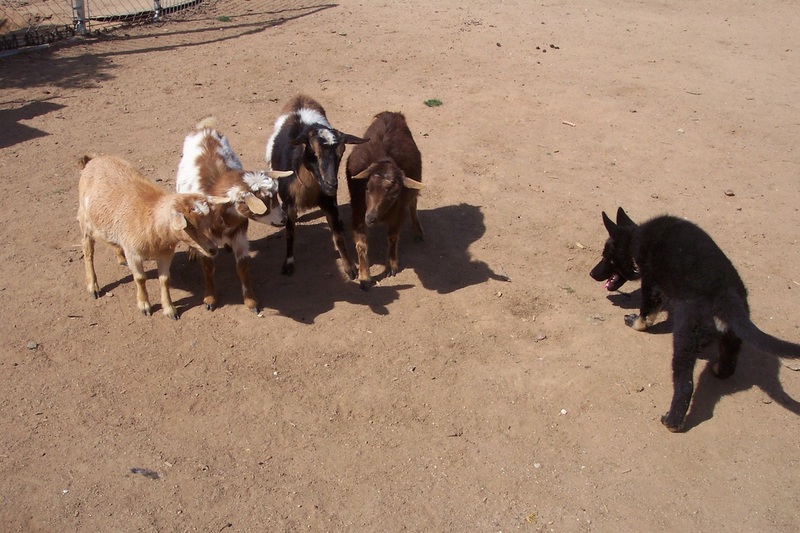 Goats would like to cross over to the oats, but Karu knows this and is not about to let it happen. Tending graze to keep goats out of hay crop Karu keeps Nigerian Dwarf goats within a weed patch and out of the hay crop. 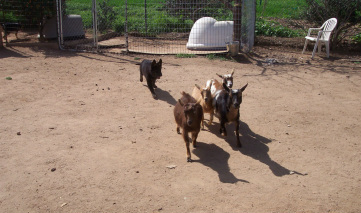 He correctly stays on the part of the border nearest the goats, while occasionally going behind the tall mallow to make sure none of the goats are back there. Karu dog-breaks Oregon Mini Geese This is the first day these Oregon Mini Geese have ever been worked by a dog. 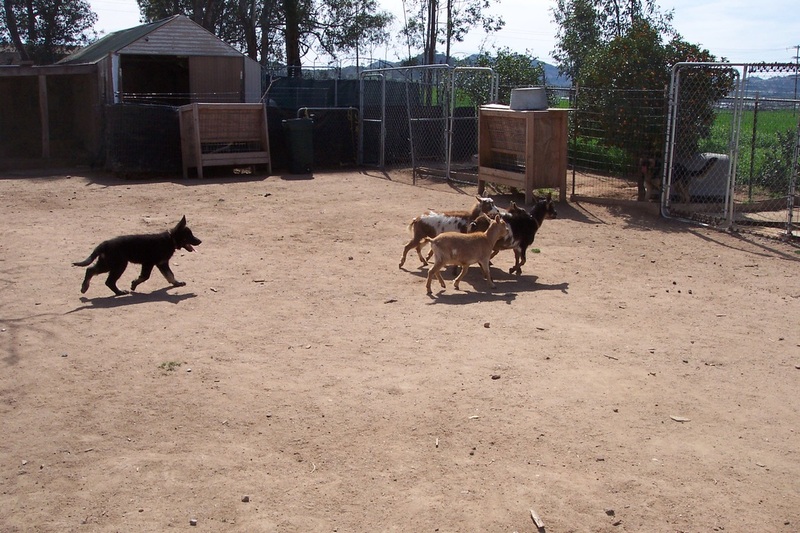 In this video, German Shepherd Dog, Hikaru Vom Insel, gets the geese used to being moved around by a dog. These geese do not like me and the female (darker grey with whiter breast) gets a little hissy whenever Karu makes them go near me. All goes pretty well until it is time to put them through a narrow area on approach to the repen. Then the female goose feels threatened in the tight (for her) area and has a real hissy fit. Kita must show patience while until the goose settles and moves away. Click here Unfortunately, you may not be able to view it, if you don't belong to FB.